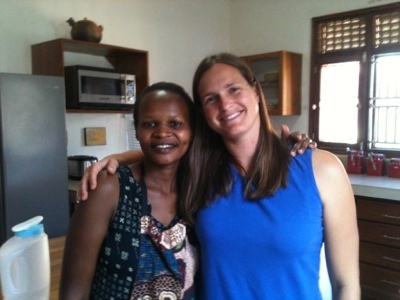 One thing that we knew as we were preparing to move to Uganda is that life here operates on a different schedule. The person you are with is more important than your deadline or next appointment. In some ways we really love that. People make the time to stop and talk with one another. It is a beautiful thing and we have really enjoyed getting to know the Ugandans we are interacting with on a regular basis. Below is a picture of me with Privah, who has become a dear friend in our weeks here. This slower pace of life and focus on relationships also means that things often don't happen as planned. Bamboo bookshelves that a street vendor made for us took several days longer than anticipated. Money that was wired to our bank here 2 days ago is still not available to be withdrawn. Desks, chairs and shelves being made for our classroom may or may not be ready for the start of school. Another aspect of unpredictability is electricity. We were planning to have a meal last night that required meat cooking in a crock-pot overnight. But when the power is out, the crock-pot doesn't work. So we just pulled a few things together and will eat the meal tonight, Lord willing, and if we continue to have electricity today. We are learning to live with the unpredictability of life here. But I don't want to just learn to be more flexible about future plans. I want to trust God with the future! This has been a struggle my whole life as I want to control things. It is ridiculous to think that I would feel better about controlling my own future than I would trusting the all-powerful, good, gracious God of the universe, but sadly that has been my one of my ongoing sins. This pre-cancerous area on my tongue has been one area in which I am continuing to learn about trusting God with the future. Please pray with me, that God will grow my faith in Him through this struggle. James 1 comes to mind as I reflect on how I desire the Lord to grow me through these trials. I would recommend reading the whole chapter, but I will just post a few verses here. "Consider it pure joy, my brothers, when you face trials of many kinds because you know that the testing of your faith produces perseverance, and perseverance must finish its work so that you may be mature and complete, not lacking anything." Well, I just kept reading and I really recommend reading the whole book! Reading the book of James would be a much better use of your time than reading my blog! And here is another passage from James that we have learned much about over the last couple of years. James 4:13-16 "Come now, you who say, 'Today or tomorrow, we shall go to such and such a city, and spend a year there and engage in business and make a profit.' Yet you do not know what your life will be like tomorrow. You are just a vapor that appears for a little while and then vanishes away. Instead you ought to say, 'If the Lord wills, we shall live and also do this or that.' But as it is, you boast in your arrogance; all such boasting is evil." And since I cannot close a blogpost with the law, I must go to a few reminders of the love of God through the gospel from one of my favorite chapters in the Bible, Romans 8. I have written a few verses here for you, but again I would implore you to read it all! "Therefore, there is now no condemnation for those who are in Christ Jesus.... For you have not received a spirit of slavery leading to fear again, but you have received a spirit of adoption as sons by which we cry out, 'Abba! Father!'... If God is for us, who can be against us? ... For I am convinced that neither death, nor life, neither angels, nor demons, neither the present, nor the future, nor powers, nor height, nor depth, nor anything in all creation shall be able to separate us from the love of God, in Christ Jesus our Lord." My Abba Father in heaven loves me better and even more than I love my own children! 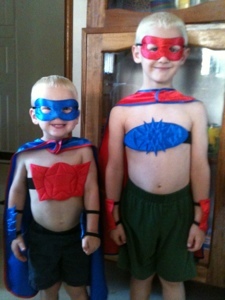 Speaking of my own children, while I was writing this Esther was dressing Zeke and Ezra as superheroes. I thought you might enjoy the photo. Love the picture of those superheroes!! !